Happy National Ice Cream Day everyone!!! Well, belated anyway. It technically falls on the third Sunday in July, yesterday. We celebrated the day with a fresh batch of the most delicious ice cream I have ever made. Em devoured hers, it was her first ice cream cone and I was so proud to have made the ice cream she was loving so very much. We must have spent 20 minutes watching her and laughing with her. She truly enjoyed that cone and I have 100 pictures to prove it. Well, a lot anyway. Mr. W only had one comment, after he handed me the last 2 inches of his cone that he had devoured without saying a word. Mind you his comment yesterday was " I am not eating 'cheese' ice cream". He thought that there was a little too much chocolate in the cone. I am a HUGE chocolate fan (especially Nutella) but I would have to agree, to the average person, it was probably a bit much. I will cut down the chocolate next time. Yes, next time. He loved it and wants it again. I think watching Em eat it convinced him that it was good. So, I have to say a REALLY good canoli might just be my favorite dessert. Not those greasy ones you get in a typical deli, but the hand made ones from 'Nona' at the Italian deli. Delish!!! It is virtually perfect, it has a deliciously smooth sweet and creamy mixture in the center of this fabulous crunchy 'carrying case', with a little chocolate drizzled on top and chocolate chips in the mix or on the ends. Heavenly! 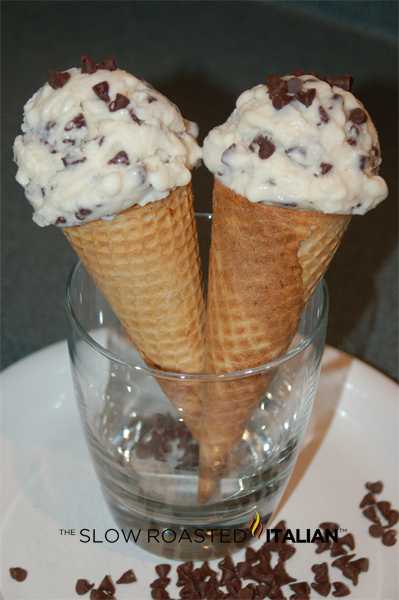 After watching Giada De Laurentiis make a Ricotta and Chocolate Chip Ice Cream Cone, I was inspired!!! Here is what I did... You are going to love it!!! Oh, and just to test the idea I made a second batch and froze it in a metal bowl in the freezer. I stirred it with a spoon every 15 minutes or so. It was delicious. Definitely more dense, as the ice cream maker mixes in air. So, that seems pretty logical. But, it was not icy like some ice creams made without the machine. I also tried it with out the chocolate chips. Absolutely incredible!!! For the Ice Cream: In a medium bowl, whisk together ricotta cheese and milk until smooth. Add the simple syrup and vanilla extract. Stir to combine. Pour the ricotta mixture into an ice cream maker and freeze according to the manufacturer's directions. Add the chocolate chips 10 minutes before the end of freezing. For the Sugar Cones: Stand 4 sugar cones in each of the 3 glass tumblers. Mix the chocolate-hazelnut spread and chocolate chips together in a small bowl. Place the bowl over a pan of simmering water, making sure the bottom of the pan does not touch the water. Stir until the chocolate chips have melted and the mixture is smooth. Spoon 2 teaspoons of chocolate mixture into each sugar cone. Place the glasses in the freezer for 10 to15 minutes until the chocolate becomes firm. In a small saucepan, combine water and sugar over medium heat. Bring to a boil, reduce heat and simmer for 5 minutes, stirring occasionally, until the sugar has dissolved. Take the pan off the heat and allow the syrup to cool. Oh. My. Goodness. When can I come over to have one?! Looks, delicious, Donna! Gotta tell you girlie, I was having a hard time picturing ricotta ice cream. This looks fabulous! Did you save me some? Oh my gosh, this sounds fantastic!!!! Very nice! I also put pistachios and a touch of orange marmalade in my canoli ice cream.... chocolate in the cone is a great idea! Really special - they look an incredible treat! Sounds like your girl had a blast :) So cool. Awesome ice cream! Fully endorse anything 'cheese' related! Oh yum -- I think I'd like cannoli even better as ice cream. Wish to god I could taste this :). Yum! Never thought of that combination. Great thinking! only the word canoli makes me drool instantly, but add ice-cream and chocolate and you have me on my knees. had to share, looks so good!!! There's a new Italian restaurant near us that sells canoli, is it wrong I want to call in an order for some and just eat those tonight? Haven't tried them yet, hopefully they're not icky. I am pretty sure this might just be my next ice cream adventure!